Reverb welcomes buyers and sellers from all over the world. Take a look at some of the most frequently asked questions we get about international sales and shipping. How do I find out if a seller ships internationally? You can check if sellers ship internationally by looking at their shipping policies on their shop homepage. Additionally, on a listing you can click where it says “Shop Policies” below the images. If the seller’s international shipping policy is unclear or unspecified, utilize the “Contact Seller” feature on a listing or in their shop. I’m a seller, how do I notify buyers that I ship internationally? There are several ways to accomplish this. When making a listing, you can assign a flat-rate shipping fee to each of the countries or geographical areas that you are able to ship to. Alternatively, you can assign a fixed flat rate shipping cost to all international orders, regardless of location. When negotiating on the price of an item via the offer system, you will also be able to adjust the shipping rate based on the location of the buyer. You have the ability to change your shipping policies in your account settings at any time, however, changing these policies will not affect orders or listings that have already been posted -- these will need to be edited individually. 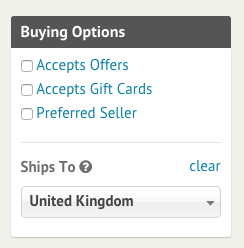 The most important thing to remember when listing international shipping as an option is to be as specific as possible. We encourage you to do some research about the cost to ship to certain countries, and can calculate an appropriate flat-rate for different areas. What precautions can I take to protect the package during shipping? We strongly encourage all of our sellers to use carrier insurance or Reverb Protection for their packages, whether domestically or internationally shipped. You can also check out our tutorials on packing guitars, packing amps, and packing drum kits. If you’re not sure about the proper way to pack an item, contact us and we’ll be happy to give you some tips. Importing duties and fees are the responsibility of the buyer. Be sure before agreeing to purchase an item that requires international shipping, that you are familiar with your country's customs and importing laws. You can browse Reverb in multiple currencies. We currently support $USD, $CAD, €EUR, £GBP and ¥JPY. Select your preferred currency using the link at the bottom of the page. When a shop’s items are listed in a different currency, Reverb will provide an approximate conversion based on the current exchange rate. As a Buyer, what currencies can I use to pay on Reverb? Currently, all items on Reverb are listed and sold in $USD. If you are outside the United States, you may pay in nearly any major currency. The funds will be converted into $USD by either your credit card provider or PayPal. Please note, you may be subject to a currency conversion fee from either PayPal or your credit card provider. Please check with your provider for information on any applicable fees. If you’re paying in a currency other than $USD the amount shown at checkout and the final amount charged to your credit card may vary slightly based on the exact exchange rate at the time of purchase. USPS, UPS, and FedEx offer shipping calculators for United States International orders. For countries outside of the US, check with major carriers in your country about shipping rates for international orders. How do I ensure that my item is delivered safely? We encourage all of our sellers, whether shipping domestically or internationally, to protect packages before they are sent to buyers. Check with your preferred carrier regarding insurance costs for international shipments. If you're using a Reverb shipping label to ship internationally, you may protect it for up to $2,500 USD. How do I verify an international address? If using Reverb Direct Checkout, Reverb will verify the buyer’s international address before marking the order as ready for shipment. If using PayPal, please review PayPal’s list of approved countries and regions for international buyer protection coverage, and if the country you are shipping to is not listed, consider a different payment method. How do I go about an exchange/return? In the event that a buyer must return an item to the seller, the seller does not need to pay for return duties or fees. Depending on the buyer’s country, the buyer may be refunded partial or full cost of customs fees in the event of a return. Whether using Reverb Direct Checkout or PayPal, in the event the seller had the order shipped via a freight forwarder, the order must be shipped straight to the seller’s verified address at the expense of the buyer in order for a refund to be processed. What items are prohibited to ship via most major carriers? Ivory and products containing ivory (e.g. fret inlays), bone, tortoise shell, and illegally harvested Brazilian Rosewood are generally prohibited or heavily restricted. Other metals, paints, and materials may also be prohibited, and for this you should check with the customs laws of the country you’re planning to ship to, particularly if the item is vintage (pre-1980). You can check out a country specific list of prohibitions here. How do I know if a seller will ship an item to me? The “Shipping Region” selection in the footer will filter listings so that you only see gear with a specified shipping rate to your region. If your search results feel too narrow, you can use the Ships To filter to broaden your search results set beyond your default Shipping Regions, or you can change your Shipping Region. If you fall in love with an item that does not have a shipping rate set for your region, you can always contact the seller and ask if they will ship to you. For a look at other frequently asked questions about our site and policies, take a look at the Reverb FAQ Page. If you have any questions, don't hesitate to contact us.